Planes, Trains and Automobiles: Holiday Exhibit peeks back at the shop windows of the past. Displays feature a host of vintage transportation toys, collectibles and award winning models crafted by local modelers. Advertisements, photographs, and miniature vehicles plain and fancy evoke the days of old when aerodynamics, detail and illusion of speed were enough to entertain American youth. 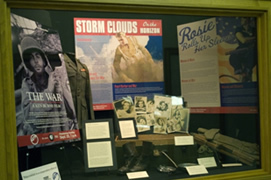 Two related exhibits that commemorate America’s and Arkansas’s participation in the Second World War. Timed to coincide with the debut of Ken Burn’s new PBS documentary, The War, the exhibits feature interpretive panels summarizing the progress of the war, historic images, and evocative artifacts. 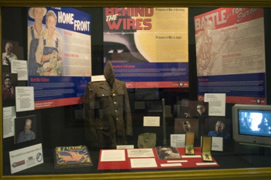 In the first floor exhibit cases, The War–And Arkansas blends narrative panels, artifacts from the collections of the MacArthur Museum of Arkansas Military History, and testimony from Arkansas World War II veterans, collected as part of “In Their Words,” an Arkansas Educational Television Network (AETN) oral history project. In the Lower Level elevator foyer, The War We Saw features reproductions of seldom-seen press photographs from the war. These images were captured by military and civilian photographers, vetted by censors and made available to newspapers and magazines. These images helped frame Americans’ perception of the conflict and the human dramas that unfolded on far-flung battlefields. Images in The War We Saw are drawn from the MacArthur Museum of Military History’s Allison Collection, an archive of over 4,200 vintage prints of wartime press service and publicity photos, most bearing their original attached captions. The original captions are reproduced in this exhibit, so viewers can read what the military censors approved for public consumption. 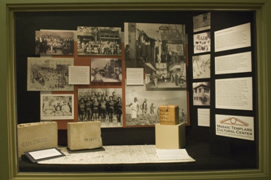 In recognition of the 50th anniversary of the integration of Central High School, this exhibit is entitled “The Legacy of Horace Mann: Before 1957 and Beyond.”The Horace Mann High School for Negroes was established in April 1956 in an effort to ease pressure on the Little Rock School District to quickly desegregate its schools. Several hundred students from Little Rock’s long-established high school for African-Americans were transferred to the then brand new facility. 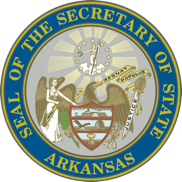 In September 1958, Horace Mann, like the other Little Rock high schools, was closed by gubernatorial order. 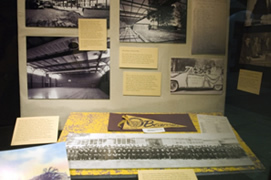 The exhibit’s artifacts, testimony, and rare images—some not seen since the 1950’s—tell the story of the school whose students included the Little Rock Nine. 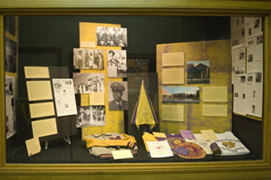 The assorted items were generously donated for this exhibit by the Horace Mann Alumni Association, UALR Archives & Special Collections, and Dr. Sondra Gordy of UCA. Horace Mann High School closed at the end of the 1971 school year with almost 3,000 graduates from 15 classes before reopening that fall as a junior high school. The school carries on today as Mann Arts and Science Magnet Middle School. The Mosaic Templars Cultural Center: A Mission, A Dream, A Museum. The Mosaic Templars Cultural Center takes its name from a fraternal order, founded in Little Rock in 1882.The Mosaic Templars of America provided both social outlets and practical benefits in the form of financial support and life insurance to African Americans within Arkansas and across the United States. The founders’ vision prospered enough so that in 1912 the Mosaic Templars commissioned a major building at the intersection of Broadway and West Ninth Street in downtown Little Rock to serve as their National Temple, or headquarters. Even after the Templars disbanded in the 1930s, the old National Temple building remained a major anchor of the African American business district located along West Ninth Street. In 2004 the building was purchased by the Department of Arkansas Heritage to serve as a cultural center interpreting the story of African American life and businesses in Arkansas from 1870 to the present. Fire destroyed the headquarters building in March 2005 but did not extinguish the vision: a new facility closely resembling the original structure will open to the public in Summer 2008 as a state-of-the-art facility with a mission: to build the cultural connections between Arkansans past and present, and to preserve and tell the stories of Arkansas’s African American life and enterprise. 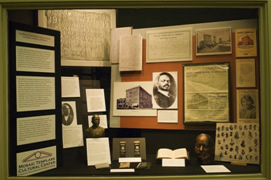 The Capitol exhibit highlighted the center’s collections, including works by artist and entrepreneur Isaac Scott Hathaway, as well as the intertwined histories of the Mosaic Templars and Ninth Street.